Whaaat? He did it! The big day is here. He's a football player! He's all ready to hop onto the gridiron and battle to win the big football game. As long as he has the right gear for the game! Get him this Little Tikes Football Player Kids Costume, and he'll be ready for all the fun. He'll be ready to rush the ball or make the big tackle. Heck, maybe he'll even be ready to line up under center and become the star quarterback. We're just not going to know what kind of player he'll be until he suits up, so let's get him this costume! Maybe we oughta hold our horses before we start dreaming about football fame. Fair enough. But you can still get plenty excited thinking about your kiddo as a football star for Halloween. 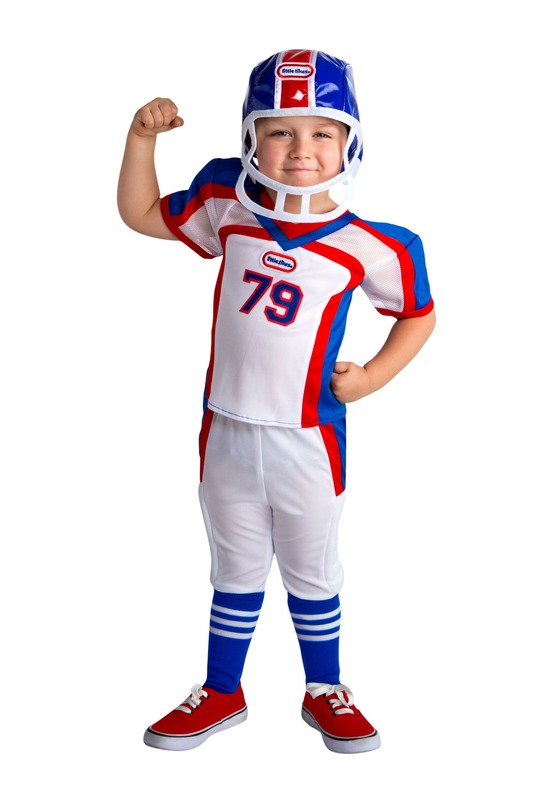 Any boy or girl will look fantastic in this kid's costume, and we're sure they'll have a blast pretending to be a real deal football player, too. Hut-hut! This costume set includes a jersey shirt, pants, and a replica helmet. The shirts features blue and red stripes and has player number 79 on the chest along with a Little Tikes logo patch. The vinyl helmet continues the color theme and also features A Little Tikes patch on the top. A soft felt “face mask” completes the football styling. Sure, he or she might be a little on the young side to think about them playing football, but we can sure imagine fun in the future with them dressed up in this Little Tikes costume. Vibrant style, coloring, and a fun design means you're going to have one cute little football player on your hands this Halloween.